In early 2014, The Phillips Collection in Washington, D.C. and the Museum of Modern Art in New York City announced plans to bring together the entire iconic, 60-panel Migration Series by Jacob Lawrence. The series portrays the Great Migration, the movement of more than six million African Americans from the rural South to the urban North and West in search of a better life. To tell a deeper story about the artist and the movement, The Phillips Collection embarked on an ambitious research project, collecting archival materials, video, audio clips, and scholarly research that provide context and perspective on this important event in American history. The result was a wealth of valuable content — but they needed a way to organize the information into a rich and engaging narrative. The Phillips Collection asked TOKY to build an interactive, robust online resource to serve as a digital companion to the exhibition for visitors to explore from near and far. At TOKY, we started by cataloguing and grouping information into four tracks, which became the site’s main navigation sections: Art, Culture, Artist, and Immerse Yourself. 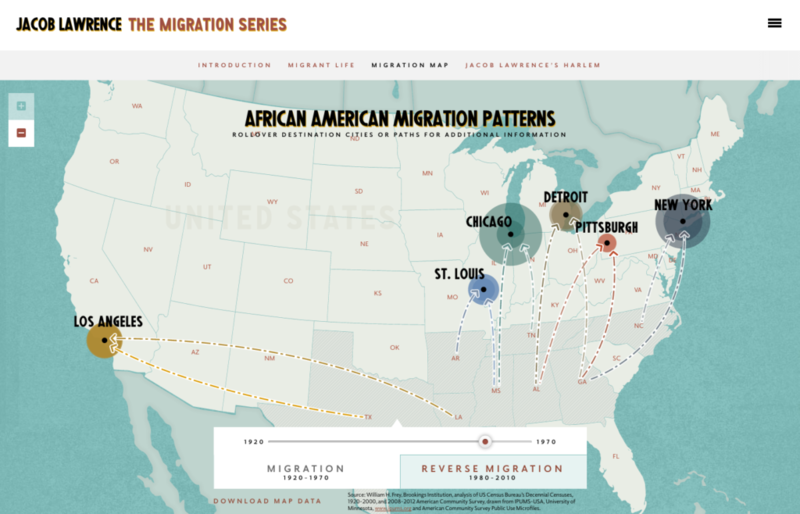 Here, visitors can explore each of the 60 panels of The Migration Series up close. For additional context, we placed each panel alongside relevant resources, whether commentary from artists and scholars, video of the artist describing the piece, or a curatorial comparison juxtaposing related works that reflect similar themes. 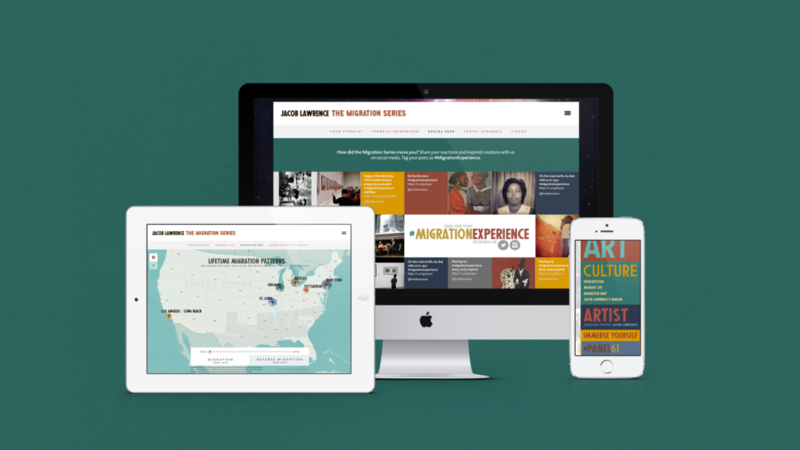 The Culture section uses stories and data to bring the Great Migration into context. Visitors can read about the experience first-hand through real letters from migrants to loved ones, or trace migration patterns on an interactive map. The culture, art, and music of Harlem during the 1920s and 1930s is brought to life through videos, photos, and artwork illustrating the neighborhood’s lasting impact and the enduring legacy and meaning of The Migration Series. As they explore these resources, visitors can hit play on a Spotify playlist curated by one of the scholars featured on the site. The site’s Artist section gives visitors a better understanding of Jacob Lawrence, the person. Historians look back on the life of the artist, and Lawrence himself shares stories and sources of inspiration in a series of videos. For a chronological view of the artist’s life, viewers can explore an interactive timeline that pairs key moments in the artist’s career with major cultural and historical events. The Phillips Collection also invites visitors to join the conversation and continue the story of migration. While The Migration Series ends with the 60th panel, the museum asks viewers to imagine and share what they think Panel 61 might look like today by contributing submissions through the website as well as on Facebook or Twitter using the hashtag #Panel61. Those who prefer the written word over digital artwork can participate by constructing a poem using the words of great Harlem Renaissance poets and writers. You can explore the exhibition, the artist, and the context of the movement at http://lawrencemigration.phillipscollection.org/, or by visiting People on the Move: Beauty and Struggle in Jacob Lawrence’s Migration Series in person at The Phillips Collection.